Oh elephants. They are just big lovable teddy bears waiting for their human compatriots to ride them, feed them peanuts, or present them with an opportunity to playfully spray water at them from their trunks. How adorable! Ask the citizens of Far Cry 4's fictional region of Kyrat, who have learned to share and balance their existence in an imperative, fragile bond with these beasts. Terrorists and other no good-doers have upset this delicate balance with their operations and in retaliation, Mother Nature has unleashed her wrath upon them with a whole army of her organic tanks. A new gameplay trailer for Far Cry 4 shows just how destructive these elephants can be as they destroy bases and purge their owners. Jeeps don't stand a chance, guns don't stand a chance. 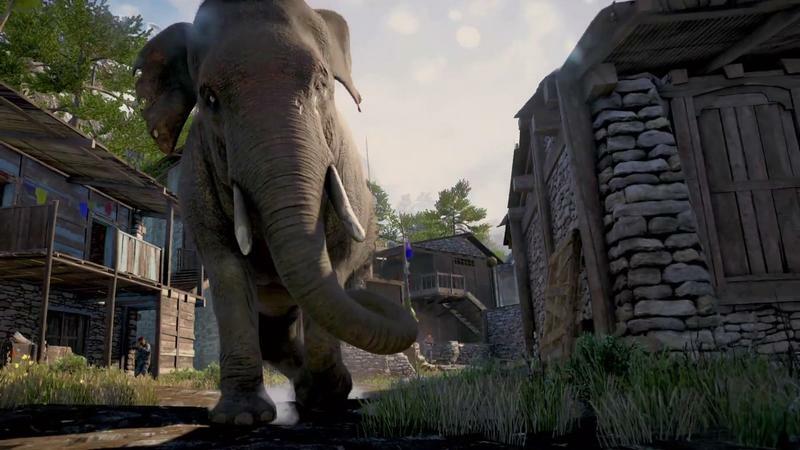 Interacting with and using these elephants are a huge lure for Far Cry 4's gameplay, and it's not hard to see why after watching. Plus, it's educational as well. A charming old chap would love to teach you about Kyrat's elephants if you can peel your eyes from the destruction and give him a genuine listen. Far Cry 4 will be released on Nov. 18 for the PlayStation 3, PlayStation 4, Xbox 360, Xbox One and PC.